Remember my birthday dinner (which I’ll blog about soon) last April 30? I mentioned there was a special surprise in store for the 30 readers I invited. There was actually a lot of surprises, but this was the biggest surprise–I announced to them that I’M FINALLY LAUNCHING MY OWN MOBILE APP! I know a lot of you have been requesting for this. Although I’ve always thought having one would be neat, I never thought it was possible until Digital Media Ph helped me out. We’ve been working on the app secretly for a few months now and after a few inevitable delays, we’re finally ready to show it to the world. BLOG – I’m sure most of you already know that my blog, even without the app, is now fully responsive. This means that whatever gadget you use to read my blog, it now adjusts itself to fit your screen and to make your reading experience easier. When you click on this tab, you’ll see precisely that. GIVEAWAYS – This is where you’ll find all the giveaways that I’m hosting or have hosted on my blog. INSTAGRAM – Follow my Instagram account, like my photos and leave comments right in my app! TWITTER – Same as the Instagram tab, this is where you can get updated with my tweets. SOCIAL MEDIA – To make it easier for you to find my other social media accounts, this tab leads you to my accounts on Lookbook, Weibo, Chictopia, Bloglovin’, etc. EVENTS – This tab contains all my upcoming events. If you want to support an event I’m going to, now you know where and when! DIARY – This is really like a diary, quite personal and a little bit informal. It’s where I’ll post quick updates and random musings my weird brain thinks of. GIFTS – THIS IS MY FAVORITE! (ALL CAPS TO SHOW YOU MY INTENSE LOVE FOR THIS TAB.) I wanted to give the people who download my app an incentive, a little bonus for letting my app occupy precious space on their phones. Thanks to generous sponsors who love you guys as much as I do, you can now enjoy special discounts and promos from them through my app. All you have to do is visit their participating branch and use my app to scan the QR code found at the branch and voila! The promo will now appear on your phone and you can use it there! For this first month, here are the participating brands: Facial Care Center (50% off on Laserlight Hair Removal Treatment on any part plus 2 additional Laserlight Hair Removal sessions on the same part upon enrollment), Melissa Shoes (10% off for cash and 5% off for credit card purchases of regular items), Early Bird Breakfast Club (get their new bestselling dessert, the Chocolate & Ginger Torte, for FREE with a single-receipt purchase of at least PhP700), Soak Swimwear (10% off for a minimum purchase of 2 pairs of bikini/swimwear), Nao Do Brasil (5% off on regular items), Tonic Bags And Shoes (10% off on regular items), The Henry Hotel Cebu (40% off on published room rates) and The Picasso (P500 discount). You can find the participating branches and promo duration of these gifts there. I’ll be changing the brands and promos every now and then. Hopefully, brands for international readers will be added soon! SUBMIT PHOTO – Do you want to send me our photo? Or maybe your OOTD that you think I’d like? How about an artwork that you did? Send all these through this tab and if you get chosen, I will post your submitted photo or artwork on my fan gallery. FAN GALLERY – This is where chosen photos from readers will be posted. WEBSTORE – Shop my new and preloved stuff here! I’m only accepting payments via PayPal though. No bank deposits. CONTACT ME – Find my email addresses for various concerns here. There you have it! 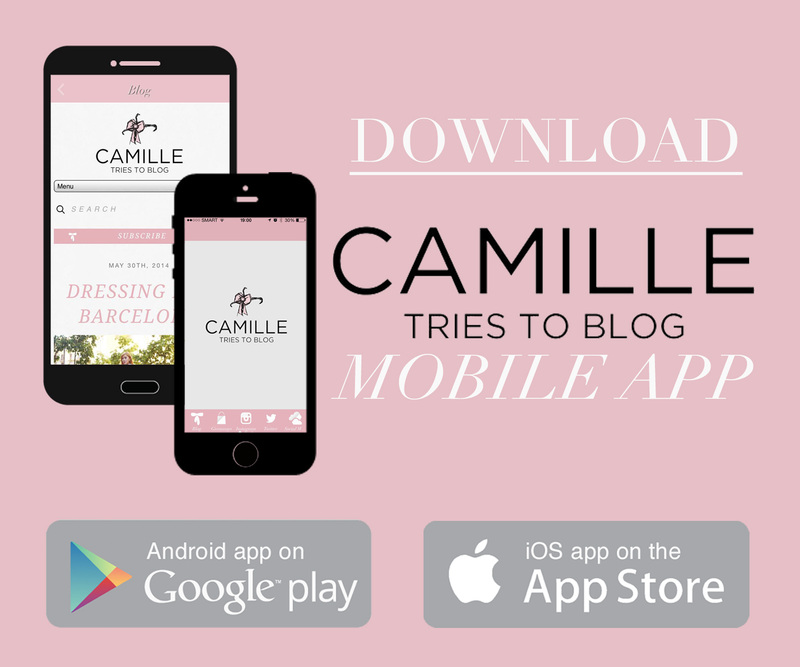 You can download my app for Android here and iPhone/iOS here or simply search for Camille Tries To Blog or Camille Co. Pretty please rate my app as well. After installing my app, make sure to allow push notifications so that you can get notified when new gifts, events and more are added. I promise I won’t send you annoying notifications. As a thank you for downloading my app, I’m also giving away Olay Regenerist Advanced Cleansing System to 3 readers. 1. Download and install my app for Android here or iPhone/iOS here. 2. Rate my app on Google Play or on the App store. 4. Leave a comment below with your Twitter name and email. Contest is open for both international and Philippine residents. Deadline for entries is on June 8, 2014 at 11:59 P.M. I’ll be choosing the winners via Random.org and announcing them here on the comments section below. Please make sure you’re following me on Twitter because I’ll be sending you a direct message if you’re selected as one of the winners. Download away, everyone! I hope you like it. Yes I saw it na! :) Thank you Denise! So glad to you have it. Honestly, I never expect this day will come. Certified camille co fan :)) this is one great app! Download it already! I’ll make sure I’ll submit a photo of us. hehe I’ve met you twice when you were in Cebu(this year) and I was really happy. Though I’ve only had a chance to take photos with you, I’ve always treasured those moments. Thank you Alda! :) Woohoo! Once again congrats Ms. Camille on your new apps. So helpful and easy to find what we are looking for in your blog. Hala mali -mali ung type ko, lol, sorry po. Thanks po! Once again congrats on your new apps. I’m glad you finally left a comment here :) Thank you Christine! Congratulations on your new app Ms. Camile irealy love your app! Rated 5 stars! Fab fashion app! Congrats on your new milestone! So happy and proud for your app Ate Cam! :) Will continue praying for you! Congrats on the app Camille! 5stars for your mobile app!! *clap clap clap* I’m so happy for you Ate Camille! Haha! Hmmm I’m not so sure! Siguro once a week? Congrats on this ms. Camille! More power on you and your blog! Hi Camille! Congrats on your new app! I can now be updated easily sa mga stuff na you share. I have always been one of your readers! God bless you always and stay pretty! Yay! I’m glad this solved your problem :) Thanks Paulyn! congrats cams!so glad that i can be much closer to you thru this app. The dinner date surprise! Teneeeeen! Hahaha! Got your app already & nakalikot ko na lahat ng tabs hahaha! Cool app, looking forward to the enhancements to make it more beautiful. goodmorning ms camille :)… kulang ang message na pumasok sa comment! hehe well anyways.i love your app!:). i rate it 5 star.. congratulations and Godbless! stay pretty..
Congratulations Camille!!! This is so amazeballs.. Ive got you in my Bloglovin.. But this is so much better.. The features in ur app are amazing. And i love how you thought of your fans, how we can interact and contribute too!!! Im positive this would be successful! Continue to inspire and influence!!! More power! Ate Camille, I’m not just saying this to get noticed but you really are my greatest style icon. I’ve been one of your avid readers since the first year of your blog. I’m quite jealous of your height and your fair skin but you have taught me to love and accept myself first before anything else. Congratulations on your app! You deserve it! Yay!! I’m back! Congrats on having a new app, Camille. Makes it easier to get more style inspiration from you on my fingertips, without having to go through multiple searches. Congrats Ate Camille! I’m so happy for you. More achievements to come pa po! Your the best fashion blogger ever! Lovelots! wow! congratulations Miss Camille! this is an amazing achievement! downloaded your app & rated it on the App Store too! it’s sooo lovely! This is great app I’ve been wait for to have an easy access w/ my fashion inspiration (Camille Co) anytime, anywhere! Thank God you have this great idea for us (your avid fans). No doubt on rating it with 5 stars.. Yay!! Thank you Ralen! More things will be posted soon! Awww :) Can’t believe it’s been a month! I also blogged about it.. and the dinner date..
Yey! Thanks for making this App! I’ve already bookmarked your website long before on my phone browser, but I still get annoyed whenever I clicked on something and redirected me to totally different websites. I had to go to the main page again to continue reading. This idea is genius! Send my regards to “Digital Media PH” too! You’re all awesome! Kudos peeps! Congrats Camille! Already downloaded it!! Downloaded it earlier already! Congratulations Ms.Cams! I hope it will gain a high download offtake! Hahaha! That’s so cute! Send them naman again. I changed the code for that so I wasn’t able to get them :) Thanks Erika! Congrats on your most awaited app!!!! Congrats, the app sounds amazing! Yay! So happy downloading it. Yipee, hooray! Congratulations, I’m happy for you Ms. Camille! I already downloaded it just a while ago and give it a 5 stars! Loving it. Congratualtions on your app Ms. Camille! I’m so excited and very happy about it! Very convenient for us readers. i already search it when i saw someone post it on there instagram that you have a app na,(nung birth day celebration mo), and installed it na AGAD AGAD haha!, i really love it. Congratulations Ms. Cams! Though I might not able to come on that dinner, it is really a pleasure that you recognize me as one of your avid readers, haaay. I wish to see you soon. Please. :-) more powers! Woot! Great viewing experience of your blog through this neat and classy application! I got your app. Looks really nice. Yay! My phone is downloading the app as I type this. So excited for this! Huge congratulations to you for this well-deserved milestone <3 Ikaw na talaga, Cams! I can only dream of having my own app hahaha. Now I feel like I'm connected with you everywhere I go! I'm excited for all the features too. Can't believe your birthday dinner was a month ago already! I hope I'll be able to meet you again soon :( Like I said, "New York has Olivia Palermo, but Manila has Camille Co" <3 Hope you didn't find my letter (the one I inserted in my present for your bday) too cheesy haha. Congrats again, Camille. My forever inspiration. Your app just makes me so happy! :) Haha! Excited to explore it! Congratulations on the new app! So excited for you! I can’t believe it, just yesterday I was watching on KBS world youtube channel a video (Beauty Bible) with K-pop girl group After School and they were showing just how good these type of clensers are for your skin!! Fingers crosses! Congrats Cams! You deserve all of the blessings kasi you treat your readers na parang close friends mo din. :) Haaay. I wanted to go to your party sana kaya lang I had family matters so hindi na lang ako nag enter ng details sa comments section. I’m quite sad. haaay. Congratulations on your new app Ms. Camile! Thank you Ransie! :) Always so supportive! Thank you Anne! :) I loved The Henry! Thank you Kaye!!! :) Yaaaay indeed! Hi ate cams! Where did you buy those “yourtea” products? I saw it on your ig kasi.